The rectus abdominis muscle is one of your abdominal muscles. If it gets too tight or harbors trigger points, it can send pain to your belly as well as to your lower and mid back region. Excessive physical exercise and emotional stress are common causes for that kind of pain. What is great though, is that very often you can relieve this muscle and thus its associated pains by massaging it yourself. Here on this page you will learn how to do this, and more. If you cannot wait, just jump right now to the palpation or massage part. As you can see in the two pictures below, the rectus abdominis can send pain to the lower region of your belly as well as to your lower and mid back. 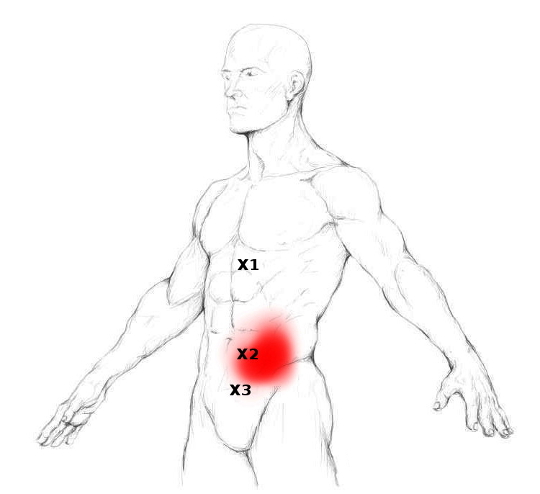 The deeper the red, the more common it is to experience pain if this muscle is too tight or afflicted with trigger points. Note: While the pain on your belly occurs on the side of the rectus abdominis that is affected, the back pains can be due to trigger points from one or both sides of the muscle. Trigger points in the rectus abdominis muscle can mimic unpleasant and dangerous conditions. If you got already checked for the following symptoms without clear results, it might be that they have their origin in your abdominal muscles. Note: The symptoms from points X3 and X1 often occur with emotional stress or during menstruation – in case of women –. Especially movements that require strong activation of your abdominal muscles or where you move your belly might be painful. Beside that, it is typical to lean forward and make yourself a little bit smaller if the rectus abdominis is too tight or harbors trigger points. So, be aware of your posture. It might be that you prefer to sit in a slumped or sleep in the fetal position, because your rectus is too tight and elongating it to its normal length is already unpleasant or painful for you. The rectus abdominis spans from the pubic bone to the 5th – 7th rib and the xiphoid process, which is the lowest part of your breast bone. The Xs display the areas where trigger points are common to develop. Hence, those are the locations you want to check properly when practicing your massage. The rectus abdominis’ two main functions are the flexion of your spine and the increase in intra abdominal pressure, which is created during coughing, for example. Beside that, this muscle is also active right before and during gait in order to stabilize your spine. Carrying additional weight, like a back pack, increases the activity of the rectus abdominis. In the latter case, this extra activity prevents you from falling back to much. It keeps you upright and your spine stabilized. There are many ways how you can develop excessive muscle tension and/or trigger points in your rectus abdominis muscle. Both scenarios shorten the muscle fibers permanently – especially in the latter case –, which is detrimental to the muscle´s health and is known to create trigger points. Emotional stress increases the tension of your muscles in general, especially in all your flexors – remember the rectus’ function –. This is because emotional stress is related to fear, which is caused – mostly unconsciously – when we are running out of options/solutions in a given situation or with a challenge in life. Your body’s response to fear is always the activation of your flexor muscle groups or at least an increase in their tension. If this tension doesn’t get relieved – via stretching, massage, breathing exercises, etc. 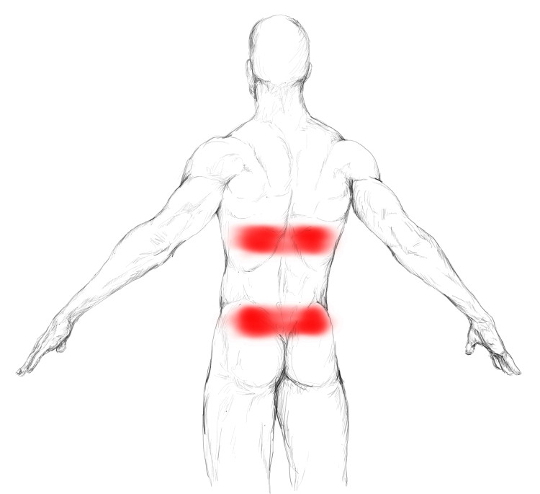 – trigger points can develop, and thus your pain. In case of the rectus abdominis, even pain that mimics visceral disease. You are in an unfulfilling relationship. You pursue a career you don’t like but can’t or don’t have the guts to quit. All those examples can put a massive amount of stress on you, your body and your muscles. Don’t underestimate that. The rectus abdominis muscle not only can mimic visceral disease but also can develop trigger points due to it. This is quite unfortunate as they will persist even after the disease itself has been gone. This might leave you with pain, and you and maybe also your doctors with confusion – if trigger points are not regarded –. Locating this muscle is a real no brainer as it is so easy to feel it during contraction. Just lay down on the ground. Then lift your head and shoulders a little bit, as if your were attempting to do a crunch. Now you can feel the muscle running from your chest bone and your ribs, down your entire belly until it reaches your pubic bone. When massaging your rectus abdominis, it will be important that you can differentiate pain created by intestines – which lie below your abs – from pain that caused by the muscle itself. To do so, tighten up the muscle, get your fingers on the area you want to massage and then loosen it up again. Now slowly palpate this area and press into your belly and search for tender spots. If you find a painful location, exert only as much pressure as needed to initiate that pain. Then contract your abs again while increasing your pressure on the muscle. If the pain gets worse, it is a sign that it is created by your rectus abdominis muscle. If your pain decreases, it might be more likely related to visceral problems. In any case, it makes highly sense to double check with your doctor here! Now let’s move on to the actual massage part. Note: In case you would like to access all this info also offline, have a look at my eBook, which contains all the info published on this website! The best way to massage your rectus abdominis, is by lying on your back and using the finger-technique. That means, you will search for tender spots, and then massage each of them with very short and slow strokes –. Also make sure to keep the muscle relaxed and bear in mind to only focus on tender spots. Use maximal 15 strokes on each tender spot. That is absolutely sufficient. With treating trigger points, it’s better to keep your massage sessions short and to repeat them frequently.